Take advantage of the seasonal produce and prepare rhubarb dishes for your family and friends. From purchasing rhubarb at the supermarket to what flavors best complement rhubarb, find advice on how to prepare rhubarb when you explore this helpful guide from My Food and Family. For a little background, rhubarb is a vegetable that is used like a fruit in cooking, Rhubarb has pink to red celery-like stalks and large green leaves. The only part of the plant that is edible is the stalk; the leaves are toxic and must be removed and discarded. 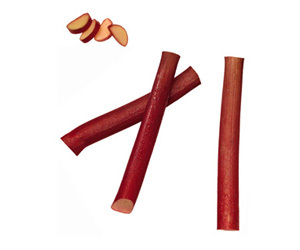 The tart-flavored stalks are always served sweetened and cooked. Field-grown rhubarb is available April through July, while hothouse varieties are sold January through June. Below you’ll find some of our best rhubarb cooking tips. Also, check out our rhubarb recipes collection for great ways to incorporate rhubarb into your cooking. Select bunches of rhubarb with crisp, straight well-colored stalks. Any attached leaves should look fresh, although they should never be eaten. Avoid rhubarb with stalks that are turning green or have blemishes or cuts. Refrigerate unwashed rhubarb in a plastic bag for 3 to 5 days. Freeze fresh, cut-up rhubarb in freezer-weight plastic bags for up to 9 months. Trim off and discard all leaves and the ends of the stalks. Remove any brown spots or coarse strings with a vegetable peeler. Wash under cold running water. Cut the stalks crosswise into 1- to 2-inch pieces. Because it breaks down easily during cooking, rhubarb is usually not cut into small pieces. Low in calories and naturally fat free. Combine rhubarb with other foods and flavors that sweeten or complement its natural tartness, such as strawberries, apples, ginger, cinnamon, orange and maple. Stir rhubarb pieces into muffin, quick bread and coffee cake batters. Substitute rhubarb for half of the fruit in your favorite crisp and cobbler recipes. Simmer sweetened rhubarb into a sauce and serve over ice cream and pancakes. As far as seasonal produce goes, rhubarb is one of our favorite vegetables to bring to the table. Its tart flavor makes it a great addition to cobblers, crisps, syrups and much more. Try your hand at a tasty rhubarb recipe today!